This time of year is apple season; one of my favourite times of the year. I love going to the farmers’ market and picking out which apples to try for that week; I am lucky that they offer a try before you buy service as there’s always new varieties to sample. This recipe for Baked Apples with Salted Toffee Sauce is a modern interpretation of a vintage classic. It offers so much for something so simple. If you’ve never baked an apple before I cannot recommend this enough. Core the apples but not all the way through. An easy job if you have an apple corer but a test of your knife skills if you don’t. Remove all the pips and tough parts but leave some apple at the bottom otherwise your filling will fall out. Run your knife all around the skin of the apple near the top so that the skin is scored but the apple isn’t cut all the way through. Mix together the raisins, walnuts and sugar and then stuff the cored apple with the mixture. Press it down into the apple well. Put the apples into a small dish or individual ramekins if you have them. Top each apple with a knob of butter then add 1-2tbsp water to the dish with the apples. Bake in a preheated oven at 160C for 30-40 minutes or until the apples are soft. Remove the apples from the oven and put to one side. Add all the ingredients for the toffee sauce to a small pan and heat up gently, stirring often. Keep the sauce simmering, while stirring, until thickened and glossy. Remove the apples from the dish and put onto a plate, add any juices at the bottom to the toffee sauce then pour the warm sauce over the top. I love the humbleness of this recipe; chances are you already have most of the ingredients you need to be able to make this dish. It’s amazing what you can cook up from a bit of old dried fruit in the cupboard and a few apples. This smelt so good while it was cooking but it tasted even better. The apple turns all mushy and soft but it’s still juicy and the raisins and walnuts add a great flavour and welcome bit of texture. Topped off with a super simple salted toffee sauce; no fancy ingredients, minimum effort, maximum flavour. I will be honest, the memory of baked apples makes me a little anxious, don’t know why, maybe the skin? Anyway yours look very good and really, who could complain if there is salted caramel sauce involved? salted tofee made everyhing taste good!!! Really nice! We make salted caramel/toffee all the time, but never combined it with baked apples. But we will. 😉 Thanks. Girl, these are like the cutest looking baked apples!! Sp pretty! I love baked apples and its a dessert I enjoy every winter, yours with salted toffee sauce look great never thought of this combination before. 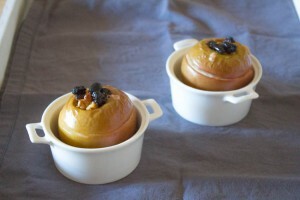 I have always wanted to try baked apples before… This looks really good! I admit that I am one of those who have never baked apples before. And I am going too. Over here, the fruit is available all year around and that means I can bake any time. I am really excited to see the baked apples – lovely and yum. Beautiful baked apple…especially with the salted toffee sauce…yum! 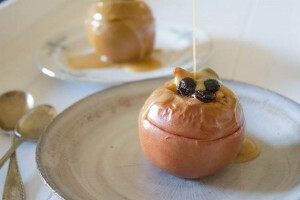 These baked apples look so good with the toffee sauce! A lovely autumn treat! Delicious and so British! This treat reminds me of my grandparents who loved baked apples. My kind of dessert! The apples look wonderful.